January 3, 2014, 8:00 a.m. The Lakers (13-19) are set to host the Utah Jazz (11-24) on Friday night, hoping to end their six-game losing streak against the 15th-place team in the Western Conference. Utah has have found a workable lineup with rookie point guard Trey Burke back from a finger injury. Burke, Gordon Hayward, Richard Jefferson, Marvin Williams at power forward and Derrick Favors are a dangerous lineup, as the Lakers found out last week. Favors' put-back slam in the final seconds against the Lakers on Dec. 27 gave the Jazz a 105-103 win. Kendall Marshall, who was in the NBA Development League a couple of weeks ago, will start for the Lakers at point guard. Obviously, this isn't what the team had in mind when they signed Jordan Farmar in the off-season as the franchise's third point guard. Instead Steve Nash (back), Steve Blake (elbow) and Farmar (hamstring) are all sidelined. Coach Mike D'Antoni turned to Kobe Bryant and Xavier Henry out of position, but both went down with knee injuries. Marshall has played well for the Lakers in limited minutes, shooting 57.1% from the field and 55.6% from behind the arc. Given that he's played just 54 minutes over four games, it's a bit early to assume he'll be able to continue at that rate. Jan 3 (Reuters) - Just when the Los Angeles Lakers thought their injury problems could not worsen, they were preparing to face the Utah Jazz with a player who was competing in the NBA Development League only two weeks ago. Eight players have so far missed games due to injury during a nightmare 2013-14 season for the Lakers and their revolving door of point guards has turned out a sixth starter in that position with Kendall Marshall suiting up against the Jazz on Friday. Marshall, 22, was acquired by the D-League's Delaware 87ers on Dec 3 before being signed up by the Lakers just 17 days later as their casualty list deepened. "Stuff is happening pretty fast," Marshall, who is averaging 5.3 points and 2.5 assists in four games as a bench player for Los Angeles, told reporters after learning he would start against the Jazz. "It's unfortunate with some of the injuries that we're having, but it's up to us collectively as a team to kind of figure it out. I just have to take advantage of it and try to help the team." 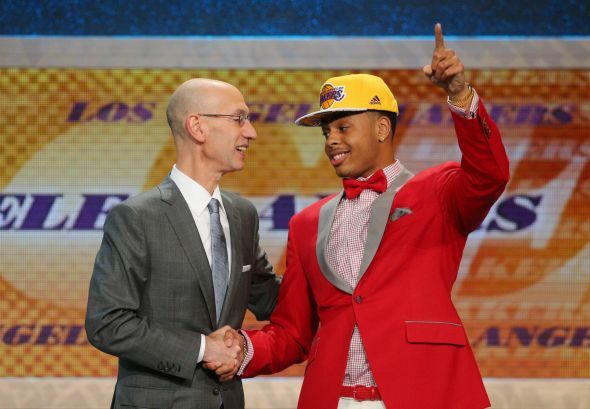 Marshall, the 13th overall pick by the Phoenix Suns in the 2012 draft, becomes the Lakers point guard following a rash of injuries to Steve Nash, Steve Blake, Kobe Bryant, Jordan Farmar and Xavier Henry. (SportsNetwork.com) - The Los Angeles Lakers will try to end a season-high six-game losing streak Friday night when they host the Utah Jazz at Staples Center. The Lakers haven't won since Dec. 20 against the Minnesota Timberwolves. That was the Lakers first game without Kobe Bryant, who is down with a broken bone in his knee. During this slide, the Lakers have also missed Pau Gasol for stretches with a respiratory illness. Gasol has been back for a few games, but that hasn't changed the Lakers fortunes. After a 111-104 loss in L.A. to the Philadelphia 76ers on Sunday, the Milwaukee Bucks came to town and pummeled the Lakers, 94-79. The Bucks opened the contest with a 14-0 run over the first 6 1/2 minutes of the game. The Lakers went 0-for-11 from the field during that stretch. "We're struggling," said Lakers coach Mike D'Antoni. "When you start the game behind 21-4 we didn't play well. We're down at the bottom." January 3, 2014, 6:00 a.m. The Lakers have lost six straight games, dropping to 13th place in the Western Conference. Injuries have derailed the team, specifically at the point guard position where recent signee Kendall Marshall is expected to start Friday night against the Utah Jazz -- instead of Steve Nash (back), Steve Blake (elbow), Jordan Farmar (hamstring), Kobe Bryant (knee) and Xavier Henry (knee). Once it becomes clear that a team won't make the playoffs, down becomes up as the standings reverse. The Lakers still have a lot of season to get healthy with hopes of climbing back into postseason contention, but at 13-19, the team may have a better chance at nearing the worst record overall. With a strong 2014 draft class, with players such as Andrew Wiggins (Kansas), Jabari Parker (Duke), Joel Embiid (Kansas), Julius Randle (Kentucky), Marcus Smart (Oklahoma State) and Dante Exum (Australia), the Lakers are gaining on the "first-place" 7-25 Milwaukee Bucks. Milwaukee, who just beat the Lakers on Wednesday at Staples Center, may be too far gone for the ninth-place (in lottery terms) Lakers to catch. The lottery gives more combinations to teams with the lesser records, and thus a better chance at landing a young franchise player. The Lakers are technically tied with the fellow, former title contender Boston Celtics, behind three teams tied at 11-21 (Cleveland Cavaliers, Philadelphia 76ers and Brooklyn Nets). The New York Knicks and Sacramento Kings have 10-21 records while the Jazz (11-24), Orlando Magic (10-22) and Bucks round out the bottom. The Lakers will be even more short-handed for Friday night's rematch as they attempt to avoid their longest losing streak in seven seasons. Utah (11-24) earned its fifth win in the last six meetings with the Lakers on Derrick Favors' putback dunk with 2.1 seconds left last Friday. The 105-103 victory was also among the Jazz's seven in the last 12 games. Utah once again won't have to face Kobe Bryant, Steve Nash and Steve Blake in this game. Pau Gasol is expected play after sitting out last week's matchup because of a respiratory infection, but the Lakers likely won't have two players who were in that game. Jordan Farmar is expected to miss the next month after tearing his left hamstring for the second time this season, and Xavier Henry is out for at least a week because of an ailing right knee. Kendall Marshall, signed out of the D-League on Dec. 20, remains the only healthy point guard. Los Angeles (13-19) was beaten 94-79 by the team with the worst record in the NBA, Milwaukee, on Tuesday. Nick Young had 25 points and Gasol matched that in his return from illness, but Marshall was the only other player in double figures during a 35.8 percent shooting performance. "We are down at the bottom," said coach Mike D'Antoni, who used his eighth different starting lineup in as many games and 17th in 32 contests. "The injuries have torn everybody up, but we have to band together and figure it out. I thought Pau played hard, though he was rusty at first. He didn't look good in the first quarter, but then he picked it up." EL SEGUNDO, Calif. -- The way Steve Nash sees it, if the next time he suits up for the Los Angeles Lakers goes south because of the chronic nerve issues in his back and hamstrings, it could be the last basketball he plays in his illustrious 18-year career. With that in mind, Nash is making sure he does as much as possible to get his body right before making what could be the last comeback attempt of his life as an NBA player. "At some point I have to also realize, do the safest thing, the best possible opportunity to play basketball again rather than letting my angst get the better of me and jumping back in there," Nash said after Lakers shootaround Friday. "I know I can get healthy. It's a matter of, 'Can I sustain it?' And I'm just trying to get that health under my belt for an amount of time where we feel confident that it can be sustainable is the tricky part, and that's probably going to take a little while longer than I was hoping." I know I can get healthy. It's a matter of, 'Can I sustain it?' And I'm just trying to get that health under my belt for an amount of time where we feel confident that it can be sustainable is the tricky part and that's probably going to take a little while longer than I was hoping. Nash, the league's oldest player -- he turns 40 next month -- originally hoped to return to the lineup sometime during the Lakers' upcoming seven-game Grammy's road trip from Jan. 15-26, but he has since decided to use that time to go back to Vancouver, British Columbia, for the fourth time this season to undergo rehab with his personal trainer, Rick Celebrini. If all goes well, Nash will practice with the Lakers for a week when they return from their extended road trip and attempt a comeback during the first week of February with about 35 games left in the regular season. "It's all super speculative at this point because it's such a weird, tricky dimension when you're talking about this nerve issue," Nash said. COMMENTARY | With only minimal financial gains on offer, the Los Angeles Lakers should not trade Pau Gasol to the Cleveland Cavaliers for several reasons. First, the Lakers should not realistically care to save the rather insignificant amount of money that the repeater tax charges. Second, the Lakers should hope to attain assets like a draft pick or a promising young player in return for the Spaniard at the trade deadline. Finally, and most importantly, the Lakers do not tank. The extra money and the potential to avoid the repeater tax may sound like appealing excuses to part with Gasol, but those numbers hardly add up for a brand that has a $3 billion dollar television contract. From a marketing standpoint, the Lakers do not gain ground by trading Gasol away and effectively admitting that they are all-in for the race to the bottom. Admitting defeat is an easy way to stop selling out the arena. Also, keeping the Spanish-speaking market directly connected to the team likely balances the modest financial gains on offer. Gasol is currently the only Laker who gives interviews in Spanish (note: Steve Nash also speaks limited Spanish on those rare weeks he is healthy). The on-again, off-again rumors of Pau Gasol‘s impending trade from the Los Angeles Lakers is off – at least for the time being. Things can always change in Lakerland, but for now, the team intends to keep Pau Gasol and ride it out with the group it has. Of course, that doesn’t come without Ken Berger’s caveat that ‘things can always change’. Gasol is a free agent at season end and if the Lakers don’t have any intention of re-signing him come next season, there’s not much reason keep him around past the NBA’s upcoming trade deadline. Depending on what moves the Lakers make in the coming month, they should have enough cap space for one maximum contract deal as they currently stand so it seems questionable if Gasol is in their future plans, despite suggestions that they intend to keep him. The Orlando Magic waived forward Hedo Turkoglu, who has been away from the team all season anyway, the team announced Friday. If Turkoglu clears waivers, which is expected since it's unlikely a team wants to pick up the $6 million still owed on his contract, he will be free to sign with the team of his choice. The Magic fielded calls from the Los Angeles Lakers and the Atlanta Hawks for Turkoglu, a person familiar with the team told USA TODAY Sports. The person requested anonymity because of the sensitive nature of the discussion. The deal with the Lakers would have resulted in more salary long term, and the deal with the Hawks had no value, the person said. Neither options were palatable to the Magic. The Magic front office didn't see Turkoglu as part of the rebuilding process. The veteran was in the final year of a five-year, $52.8 million deal. He was due to make $12 million this season but by waiving him before Jan. 7, only $6 million will be paid out by the Magic. Los Angels Lakers point guard Steve Nash's effort to return to the basketball court will continue in Vancouver as he prepares for a possible February comeback, according to Lakers.com. Nash had trouble with injury from the onset of his stay with the Lakers, as he suffered a fractured leg and dealt with the aftereffects of his injury. Nash still struggles with nerve irritation and a number of other injuries. Despite his struggles in coming back, Nash has not wavered on his intention to re-join the Lakers. "I feel confident I have the chance to play again," Nash said, according to ESPNLosAngeles.com. "It’s just a matter of how lucky am I, how strong can I get." The constant issues for Nash have led to rumors he could possibly retire, and, in his most recent comments, Nash sounded like a man who is aware that the end is near. "I really love the game and I know that I’ve got a really short window of basketball in my life so I just want to get out there," Nash said. Jodie Meeks — you know, one of the few healthy guards the Lakers have left on the roster — has been officially warned by the league for flopping. As he should have been. You can see the play above — it’s late in the Lakers loss to Bucks New Year’s Eve and the Lakers were dreaming of a comeback. Milwaukee’s rookie Giannis Antetokounmpo got the ball on the left wing beyond the arc and swung through his elbows to create a little space, then used that to drive left. As the elbow came through — and it wasn’t close to hitting Meeks — he sold contact and flopped backwards. For those of you scoring at home, that makes 17 NBA players warned for flopping this season and two of them went on to get $5,000 fines for a second offense — James Harden and Corey Brewer. The Cleveland Cavaliers reportedly have offers on the table to ship center Andrew Bynum elsewhere. The Cleveland Cavaliers have "a few" trade options that would rid them of Andrew Bynum before his contract becomes fully guaranteed for the rest of the season. Whatever Cleveland decides to do, it appears the team likely won't send any other significant piece out with Bynum, according to Yahoo! Sports' Adrian Wojnarowski. The Cavs will weigh their options and aim to make a decision by Monday. If they were to release him, they would have to do it by Tuesday, as it takes three days for players to clear waivers and his contract would become guaranteed for the year on Jan. 10.